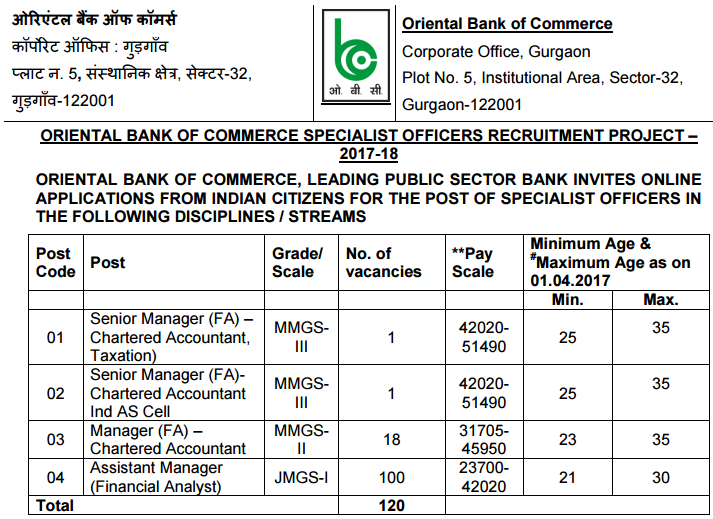 Oriental Bank of Commerce (OBC) Bank, a leading public sector bank, had issued a job notification for 120 Specialist Officer (SO) posts. Interested and Eligible candidates can apply for this vacancy from 07 April to 26 April 2017 via obcindia.co.in. 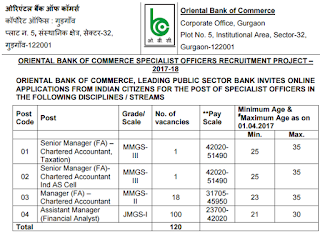 Oriental Bank of Commerce is starting Specialist Officer Recruitment Project 2017-18. For accomplishing this task, the bank had taken the first step by released the notification. 21 to 30 years for Assistant Manager posts. Check OBC SO Notification for details. Fee can be submitted only through online mode. 1 year and 2 years. Eligible candidates can apply online through the website www.obcindia.co.in from 29 April to 13 May 2017. Starting Date to Apply Online: 07 April 2017. For more details, download the OBC Bank SO notification from below.